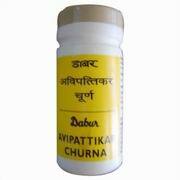 Avipattikar Churna is a classical formuale used for Hyperacidity and Heart burn. 1.5 to 3 gm (1/4 to 1/2 teaspoon) twice a day with milk or warm water. A bottle of 60g powder .